The Voyager resort in Mombasa must be my favourite resort so far. Everything is good about it! The food, the rooms, the people, the beach, the activities, everything! 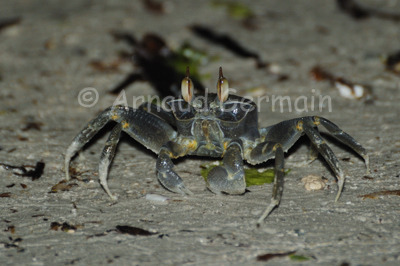 Every night, after dinner, I went to the beach with my children to show them the ghost crabs that are invisible during the day and try to catch and release some. On that particular night, I took the camera to photograph the different species. I counted no less than 8 different types of crab in about 30 minutes. Nikon D700, Nikon 70-300mm VR lens at 300mm, F5.6, 1/60s, ISO 800, Nikon SB 800 flashgun set on TTL, handheld.